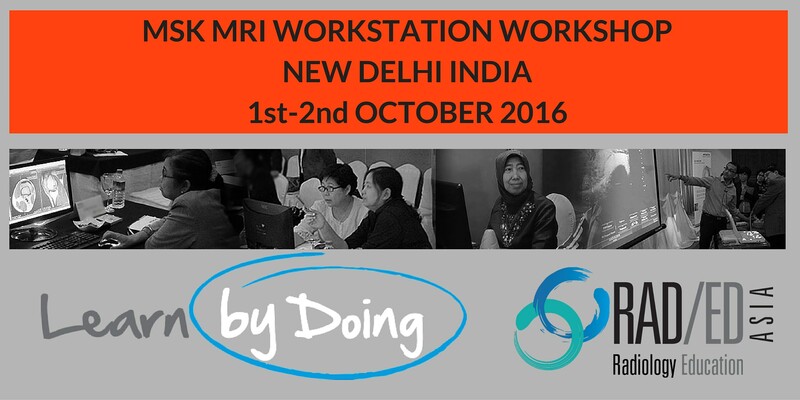 MSK MRI Workstation workshop Delhi India October the 1st and 2nd 2016 will be covering MRI of the Knee, Shoulder, Hip and Ankle in an intensive, structured learning, workshop over two days with lectures and guided viewing of 100’s of full Dicom studies of MRI pathology on individual workstations, so that you learn and apply the knowledge at the same time and you Learn By Doing. Learn by Doing: The best way to learn something is to do it. Lectures and conferences give you information but they dont tell you HOW to apply it. Knowledge from lectures and conferences on its own is of no use if you cant put it into practice in your daily work. We give you the knowledge, then teach you HOW to put it into practice. HOW to report accurately and confidently and what to report and what to ignore, with our guided, intensive workstation based workshops. Fellowship style learning where you actively look and are guided through full dicom studies on individual workstations and can ask questions to clarify doubts. You are not left on your own to view cases as we do guided viewing of MSK MRI pathology in 100’s of dicom studies so you learn like in a fellowship. See in a weekend MRI pathology thats taken us over 10 years to gather. View dicom studies from various field strength MRI’s and learn how to assess both arthrographic and non arthrographic studies, so that you are not limited to only one sort of imaging. Learning is not just gathering facts. Its no use if you cant retain and recall that knowledge when you need it. Our structured method of learning increases your ability to retain and recall the knowledge you gain when you need it when you are back in your own clinic or hospital. In my 20 years in radiology having trained registrars and fellows and in the workshops we now deliver, I have found that the best way to learn something is to do it. Theory is necessary but if you cant apply it in your daily practice accurately and confidently, its of no use. 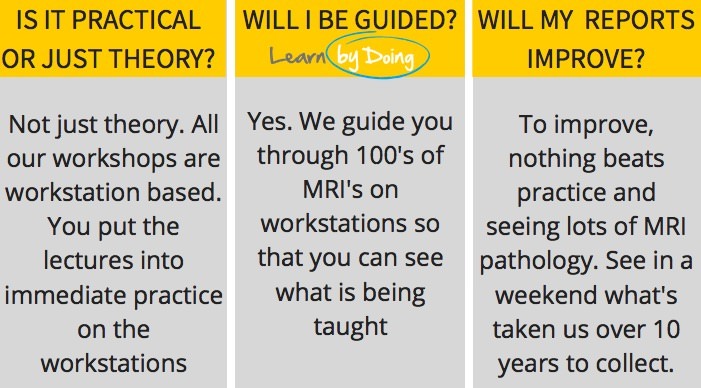 Learning is never a spectator sport and in the MSK MRI workstation workshop you will be actively involved in assessing scans which is the best way to learn and to retain and remember the knowledge when you need it in your daily reporting. Workshop run by Dr Ravi Padmanabhan, Director of Radiology Education Asia based in Singapore. Dr Ravi trained in Medicine and Radiology in Australia and is fellowship trained in MSK MRI. He has worked in centres for imaging elite athletes in Australia, and has extensive experience in Musculoskeletal MRI and teaching and has been a convenor of the RANZCR Annual Scientific Meeting. He has been running workstation based MRI workshops across Asia and Australia for over 10 years. Work book with all the lecture slides. Lunch and morning and afternoon refreshments for both days. Welcome reception for all registrants and faculty on the first day. This workshop has been very popular in other countries and has sold out early so please register early if you plan to attend. Registrations are limited to ensure that all attendees can get individual attention.